"In an April Vanity Fair article which also investigates the complicated reasons why London has become a tax haven for the world’s mega-rich, Nicholas Shaxson reveals just who owns what in London’s One Hyde Park, the apartment building built by two British brothers, Nick and Christian Candy, together with Waterknights, the international property-development company owned by Qatar’s prime minister, Sheikh Hamad bin Jassim al-Thani, where apartments go for nearly $12,000 per square foot." 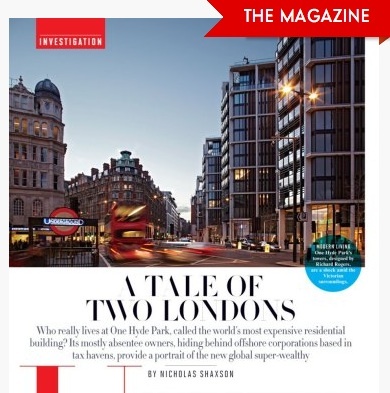 "Now the British property tycoon has become the proud father of twins – whom he has apparently named after two of the world’s most well-known tax havens. Isabella Monaco Evanthia and Cayman Charles Wolf were born two weeks ago, and a source close to the family told The Mail on Sunday: ‘The names seem to be entirely deliberate, sticking two fingers up at the taxman.’ "
Our emphasis added. We've just checked, and it isn't April 1.